Palo Alto Mosque will be the first newly constructed mosque on the Peninsula. The existing structure on the site is a former church, currently used as a temporary mosque, and as such lacking the necessary elements to be recognized as an official mosque within the community. 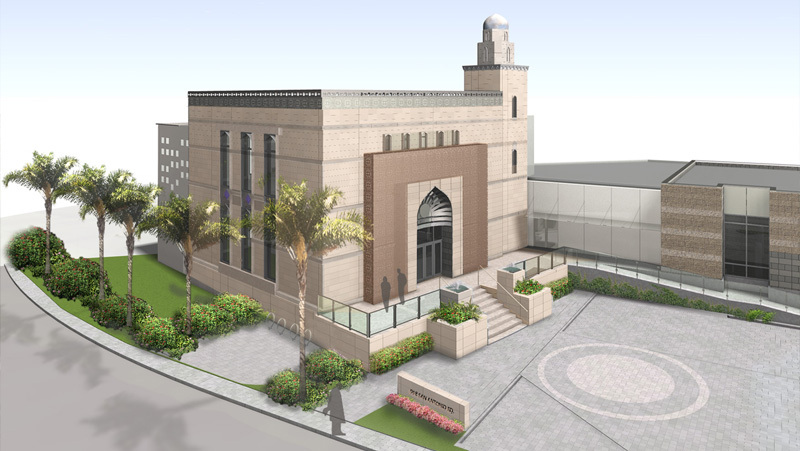 The Mosque will become a religious and cultural destination for Fatimid Muslims living in the surrounding areas and an addition to the multi-cultural fabric of Palo Alto. The Mosque consists of two major parts, the two level masjid (prayer hall) and a single level community center that provides informal congregation spaces as well as living quarters for the Mosque's imams and visitors. In accordance with the Islamic tradition, the masjid is oriented in the direction of Mecca. The mihrab (the imam's prayer space) emphasizes this geographical and spiritual connection and allows the congregation within to identify the correct direction of prayer. The minaret (the segmented tower rising above the Mosque) joins the two functionally separate parts with the circulation core below it. Even though the upper portion of the minaret is not accessible, the minaret has an important historic and religious symbolic value that within the Islamic context defines the structure as a "mosque." The minaret will be a visible beacon for the Fatimid community coming from highway 101 and elsewhere.